Do you have symptoms of FOMO (fear of missing out)? We’ve got you covered! You can read on for the favourite destinations of sledders across Western Canada. We all have our favourite go-to places but it is great to try out someone else’s favourites. Diversity is the spice of the sledding life! 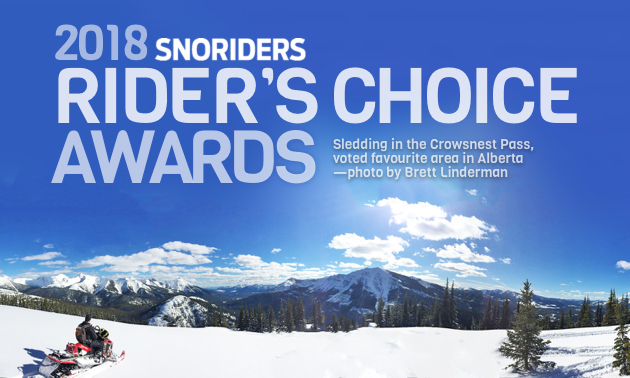 These suggestions came from our readers who cast their votes in our 20th annual SnoRiders Rider’s Choice Awards and cover our western provinces—British Columbia, Alberta, Saskatchewan and Manitoba. Whether you’re looking for mountain riding or groomed trails, deep powder or fabulous scenery, challenging sledding or family-oriented trails, you’ll find it all on this list. Our readers have also indicated their favourite resorts, restaurants, snowmobile dealers and products.